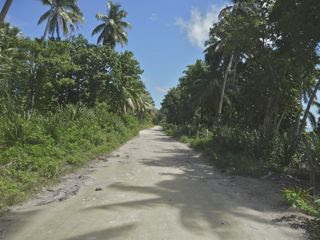 Just a couple hundred miles from Samoa, we arrived at the northernmost island group of Tonga which spreads several hundred miles and 170 plus islands from north to south. 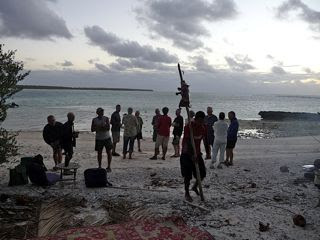 This island, Niuatoputapu (referred to from now on as “N”), is remote and pretty primitive. The name means island of the many sacred coconuts. Of all the places we’ve been, this has been the one where our donations are most appreciated. We brought reading glasses to give away which are well appreciated here, and notebooks, pencils and pens for the kids. Just a couple weeks before our arrival, the ferry boat sank in high seas in Tonga. It was on international news because 70 plus people died as the ship went down very quickly (mostly women and children), but, it also happened to be the supply ship so this island received nothing of its usual supplies before we arrived (they only get supplies once/month)—they’ve had no supplies for more than 2 months. Even so, the people, though sad about the tragedy, have dealt with the lack of supplies with equanimity—they are not strangers to deprivation. Besides government jobs (and many of the people assume multiple roles in “government” here), we would be hard pressed to know how people actually make money here. There is no commerce per se, no tourism and the life is mainly subsistence. 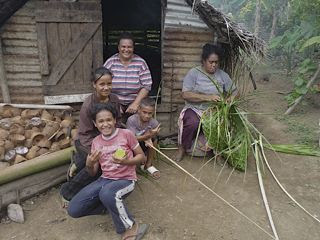 One islander makes money selling kava to his fellow Tongans and also travels to New Zealand to sell kava. 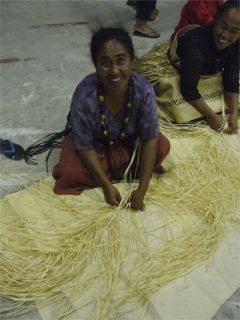 The women make beautiful weavings that are sold in tourist shops in other islands and to Tongans overseas. The visiting yachties have been warmly embraced and become a vital part of island life, supplying donations of goods and sometimes money to keep things going. Today 5 of the guys went to see if they could get a village water pump working—vital because it serves the only health center on the island. More on that later. On arrival, we are expected to ferry the 4 officials out to the boat for check-in. There were Customs, Agriculture, Health and Immigration officials. The Immigration official is also the principal of the high school so check-in had to occur after 4 PM. The Health official is the only health care provider on the island, a nurse practitioner, and she is also the head of the water commission. During the check-in process we arranged to visit the Methodist church in one of the villages followed by a luncheon at the local resort (singular), which rarely seems to have guests but whose proprietor has become integrated into the local community. 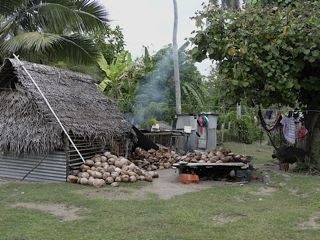 The island consists of 3 villages (mainly ex tended family groups). 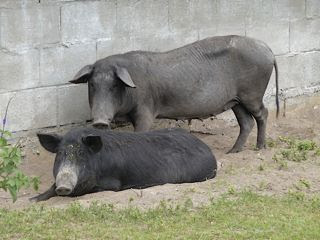 When I asked about who eve rybody marries, the pastor’s wife giggled and says they often marry cousins but everyone ignores the family connections. The villages are all connected by a very rough dirt road, driving on either side of the road seemed to be okay unless you meet another vehicle and then the rules of the road apply but only loosely. Driving here is on the left side, we think. The day after we arrived, a tour of a neighboring island had been planned and we came along. 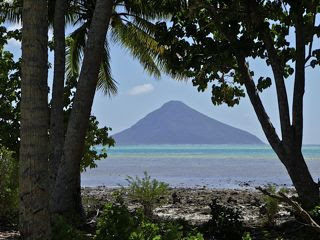 This island Tafahi is a perfect volcano cone, very picturesque and about 5 miles away. The hus band of one of the Customs officials came from there and he leads tours there. We piled into his small motorboat early in the day and drove over to the island (8 of us) seeing humpback whale blows along the way (they come here and mate and calf this time of year, very exciting). 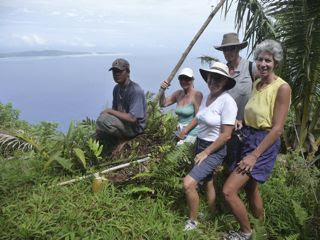 The island has a primitive village at the base of the mountain which a couple of our group stayed at rather than hike. The rest of us hiked up to the top, an initially reasonable trail that became quite steep near the top and a little slippery. It was a good work-out and a dirty, sweaty, but satisfied group rested at the top. 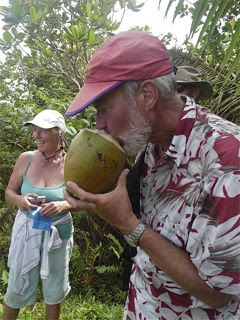 N iko, our guide, provided coconuts for liquid refreshment (using his machete masterfully to cut open the nuts so we could drink the juice), and collected bamboo to demonstrate the very fresh water within which we also drank. Niko was amazing. 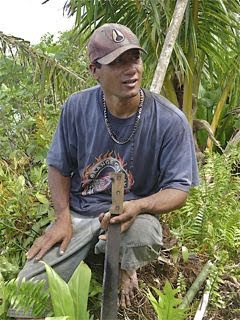 He caught 2 fish on our way over, cut down a banana stalk and quietly, in 5 minutes, fashioned a carrying device for the very heavy stalk, made of pandanus leaf and a green branch, as well as collecting the coconut and bamboo. He climbed the volcano slope in flip-flops and, when it got too s lippery, reverted to bare feet. 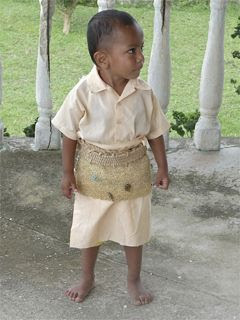 Meanwhile, in the village, they had collected mangoes, papayas and taro leaves for Niko to bring home. A wom an in the village fashioned 2 baskets out of the palm leaves in just a short time to carry the supplies. A tired but satisfied group returned to our boats in a wild squall with rain so hard it blotted out all visibility for a short while. The church visit was amazing for the beautiful harmonic singing and afforded us the opportunity to meet the minister, his daughter and her friend and his wife. We feasted with the nurse practitioner and her husband and family as well as other yachties that afternoon on the resort and walked around to some sunken lava tubes where we swam through lava tunnels and generally frolicked. Gina and I visited the health center one morning. There we were aghast at the rudimentary conditions in which the nurse practitioner works. 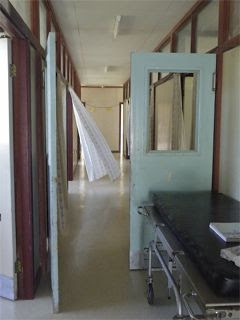 There are so few supplies or medicines, no lab testing facilities to speak of and so little equipment. Also, at the time we visited, the water pump was not functional so there is also no running water of all crazy things at a health center. But we were impressed with the public health nurses statistics on the entire population (1010 people), their diseases and health status and goals for each year’s improvement in population health. The nurse practitioner does an amazing job with what she has to work with. We offered to come work with her and I consulted on a puzzling case she was dealing with. This is the kind of place where anybody can help because the people have so little. The villagers are delightful. The children see us coming and run out to say “hello” or “bye” (which I don’t think they understand). They say “what is your name” and “where’s my lolly ” (which means candy) almost all in one breath? It is odd their training to beg for candy but they are distractable and take no for an answer and enjoy interacting with us in other ways after the initial contact. Richard was a hit with his camera and the kids love to mug for pictures and giggle when shown what they look like on the digital screen. And by the end of our visit, “where’s my lolly” was replaced with “take my picture”. Progress. On Sunday we took advantage of the bakery which only bakes that one day and doubles as a police station the rest of the week—the police chief is the baker. Our calendar seems to be fuller here than anywhere else we’ve been. There was the volcano visit, the church visit and luncheon, the health clinic visit and subsequent volunteer mornings at the clinic, the water pump work party, the resort party, the village fundraiser with dancing, a feast, demonstration of w eaving and chance to sample kava and a traditional pig roast. In between we cleaned the bottom of the boat and tried to enjoy the marine life—whales outside the reef and snorkeling on the reef. Yet, it is the least developed of the places we’ve been. 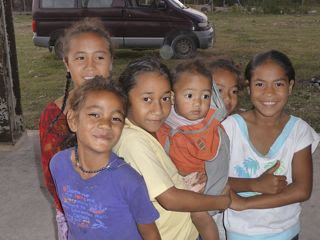 It is wonderful to be drawn into the village life and we hope that we have been able to help, all in our unique ways. For the most part there have been around 7 or 8 boats here and we are all dragging our heels a little because the next island group in Tonga is where hundreds of yachties are finally drawing together for their last South Pacific destination before the cyclone season and the run for Australia, New Zealand or north of the equator. We are relishing the relative quiet and the marvelous community here. One morning, Gina, an RN on another boat, and I went to the village clinic near the wharf. The nurse practitioner for the island rotates between the villages during the week and, at this village, she has to bring traveling supplies because they see patients in the community hall—a big empty room. Patients sat on mats waiting, kids playing, and we health care people sat on another set of mats on the floor seeing patients one by one. There is no privacy so no real exams are done (just the relevant part shown). But the nurse practitioner did make use of the gathered patients to do some group teaching on hypertension and diabetes (weight loss and exercise) since the gathered group had many people with these problem. There was no running water in the building and the mats we sat on were filthy so it was a stretch for me to tolerate those kind of conditions, especially when presented with several kids with disseminated scabies (!) But the people were stoic and patient with interesting medical issues and there was always lots of laughing. While the nurse practitioner went to deal with the water pump problem (wearing her other official hat), I saw patients myself, adding my notes to the charts. Her nurse was an excellent support, providing some translation services. Regardless of how busy we were, we stopped for tea around 11 AM which on this tropical island turns out to be coconut water (from fresh coconuts) and bananas. Very civilized. When we packed up to go, someone had brought more fruit for us to take with us and some cooked sweet potatoes as a gift. Overall, it was a lovely experience and enriched my life of travel. 3 boats went to the high school one afternoon to see the students practice a dance and singing presentation in preparation for an anniversary celebration of the school. We were placed in chairs watching the kids in formation doing their dance. The “conductor” stood on a plastic chair and beat on it with a wooden stick to keep time. We watched them practice the whole routine twice. At the request of the principal they also did some singing including the Hallelujah Chorus, done in their magnificent harmony. We so enjoyed being able to see the kids in their element. On a subsequent visit, we were given gifts of a placemat woven by the students. The high school happened to also be the only place where internet is available on the island so we made one journey there to use the computer. We timidly poked our head into the classroom where the computers were and found the economics instructor in the middle of class. He motioned us in and let us work on the computers on one side of the room while the class went on in Tongan and English on the other side. They had to start up generators for us to use the computers which the school clerk quietly did on our arrival. Just before we left, we heard from a boat struggling in wild conditions 20 miles away—they wanted to come into our anchorage after dark. We responded on VHF radio and arranged for Niko, the one who took us to the volcano, to take Richard out to the entrance and meet the boat and guide them in and to an anchor spot for the night. We well remember the feeling of looking for relief from a nasty passage and how grateful we were for the help of our fellow cruisers and this was a chance to give back. Richard and Paul encountered 8 to 10 foot waves outside the reef entrance and were able to bring the boat in successfully. The crew was tired, grateful and thanked us with dinner the next night. Ultimately, the day came to leave the island when the wind finally calmed to a manageable level. Time to move on. This was one of the most enriching experiences of our cruising life. So rarely are we brought into the local people’s lives to the extent we were here. 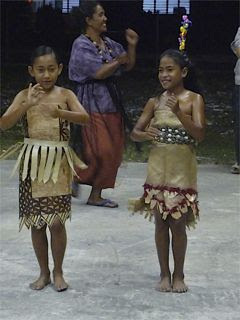 The Tongans we met were friendly, warm and self-sufficient, generous with whatever they had to share. 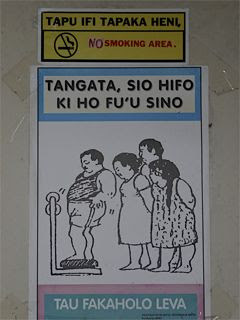 Perhaps this is why Tonga is referred to as “The Friendly Islands” since the time of Captain Cook!